It's the last full day today, but I think that we've all had enough of each other's company. There's no arguments and the relentless mocking and cruelty is still being taken in good humor, but there's a tension in the air. This is the longest we've been away as the group. At one point MW admits that perhaps 7 nights is just a bit too much. JR and SS head home with the minimal of ceremony and they ride home separately as JR wants to buy his lad some gifts before he goes home but SS is primed and wants to get going. Some of the lads are just going back to Mallaig again but I decide to take a different route that LJ has suggested so we head out together. 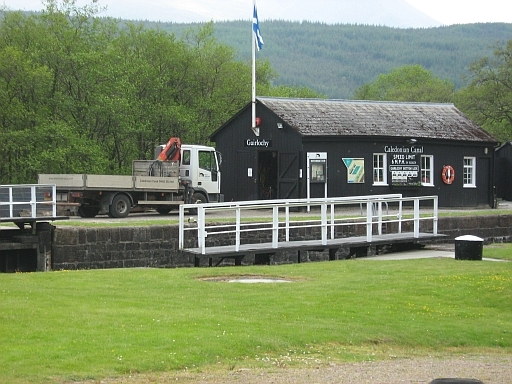 It's a simple route that first takes us to Fort Augustus where we stop for tea. I'm so tired. I'm so tired that while LJ heads off to the Locks of the Caledonian Canal I fall asleep on the table outside the cafe. It's not a comfortable bed so I don't sleep long and as I wake LJ's on his way back. After that we head along the A82 to Invergarry then turn onto the A887 heading towards The Kyle of Lochalsh....again. It's fast...again. So fast in fact that I decide it's too fast and I slow to a more sensible and sustainable pace. I bother to look at the place, to take in the wide valley between the mountains, to see the brook that runs alongside then under the road, to notice the lambs in the fields, to observe the rusty tractor on top of the rusty trailer and to marvel at the wide open spaces. We don't go to The Kyle of Lochalsh though, we turn back towards Fort William along the A87. Rise and fall, twist and turn, lean in, power out, it's all becoming rather predictable now. Fun is fun and I'm still enjoying it, but fun fun fun just becomes normal after over 1000 miles. I've lost LJ now, by agreement. He's headed on with his own plan, mine is to turn down the back road, the B8004, next to the Commando Memorial. The B8004 is a single track road that leads down to Gairlochy. 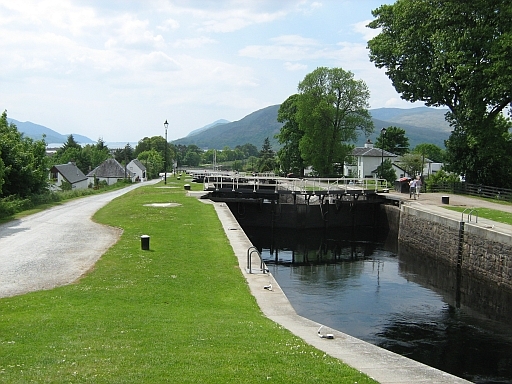 At Gairlochy there are a couple of Locks along the Caledonian Canal, a pub and that's about it. After Gairlochy the road winds its way down towards Fort William. 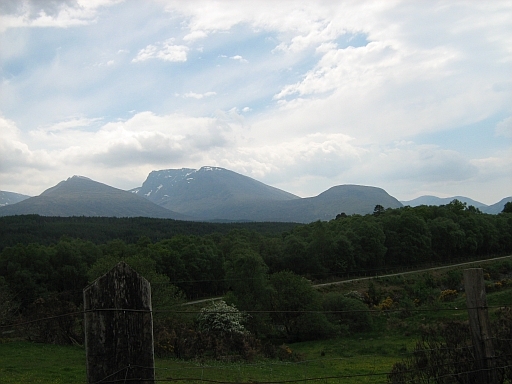 Along the way I see what I consider to be the best views of Ben Nevis. Here I'm away from the traffic and tourists with a clean view across the flatlands before Ben Nevis and its supporting cast of mountains that rise steeply from the landscape. I stop just for a moment to take a picture or two and to take it in. As I ride on I notice I'm riding quite slowly now, cruising and drifting rather than flying. It's nice. It's also a bonus as it makes it a lot easier to avoid the prat that wants to wipe me out with his 4X4. As I approach Fort William I spot a car park signposted for Neptune's Locks. That's Locks as in Caledonian Canal Locks as opposed to lake sized Lochs. Somewhat confusing I know. 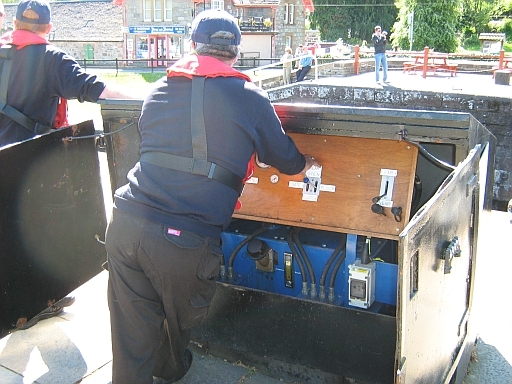 I've been impressed by the locks at Fort Augustus and I believe there's even more here. I park the bike and on this bright warm afternoon I walk along the towpath next to the impressive engineering. It's too hot though. It's too hot for over trousers, a jacket and all the motorcycling equipment. I cross over a closed lock gate to a tiny shop and buy a nice cold can of pop. As I sit on the grass near a lock and young German couple sit nearby and talk in their harsh language. Neptune's Locks in the warm sunshine, a little too warm in bike gear. I reflect for a while. It's my last day and really I should be making the most of the fine weather and the fine riding roads nearby. I've done enough this week though, I'm all fasted out. I thank good fortune for not punishing me for the mistakes I've made on the road. I thank good fortune too for such fine weather. I hope to get home safe and sound tomorrow and I hope all is well back in the North West. I start to drift off, first into daydreams about wealth and travel, then slowly towards sleep. I'm rudely awoken by the noise of a lock gate clanking home and the engine of a yacht being started. It's not late when I get back to the BnB. It's a hollow feeling though at the end of a holiday. There's the looking forward to my home comforts, my own bed and my own space, but then there's the crashing sound of reality coming back. The return to work, the routine of life and the hassles of bills and shopping. Overall though I'm glad to be packing and preparing for my return home.